Long before LGB reinvigorated garden railroading with their "G-Gauge" trains, people had been running other kinds of trains outdoors, including O-gauge trains from companies like Lionel. Of course Lionel trains and accessories were rust-prone, so people had to take their trains back in when the weather turned damp, but recent developments in track have made O Gauge Outside more feasible than it was just a few years ago. 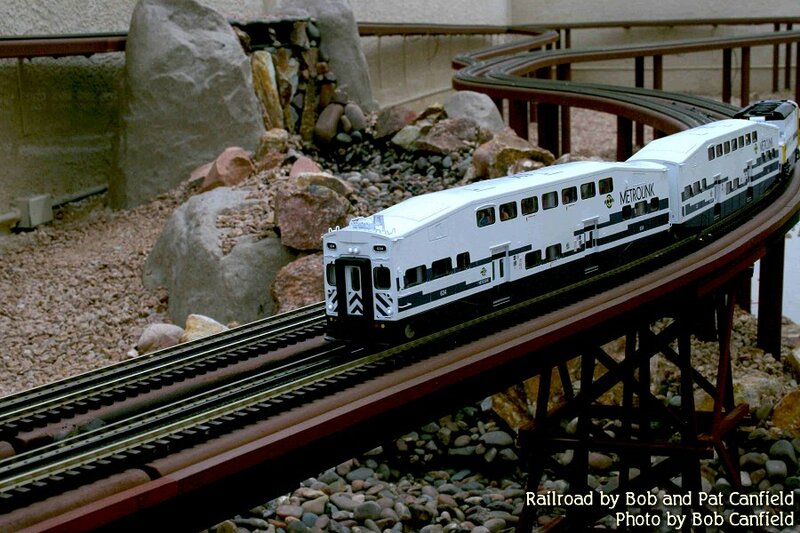 If you don't already have Lionel trains and accessories, and you want a garden railroad, please investigate Large Scale trains, like those by AristoCraft, Bachmann Big Hauler, and LGB - it really is easier to build a garden railroad with trains that are made to run outside. 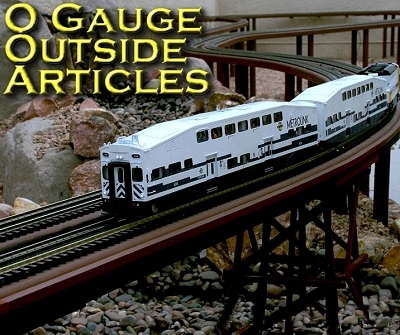 Introduction to "O Gauge Outside - An overview of the state of the hobby, including both the successes that have occurred and the compromises folks have had to make. Planning an O-Gauge-Outside Railroad - What to consider, what options have been tried, how to protect your trains, and much more. Part 2 - Building an HDPE Roadbed Infrastructure That Will Survive Las Vegas Summers. Part 3 - Finishing Touches on an HDPE Roadbed. Little touches that make an HDPE roadbed look great. Part 4 - Installing Atlas Nickel-Silver O-Gauge track on HDPE Roadbed. When three-rail flextrack is a good idea and when it isn't, and more. Using Lionel's TrainMaster? Command Control Outside - Tips for using TMCC outside, including wiring suggestions and methods for providing a "ground plane" in an outdoor environment.